Northwest High School's Taylor Wright won three events to lead her team to its fourth consecutive team title. 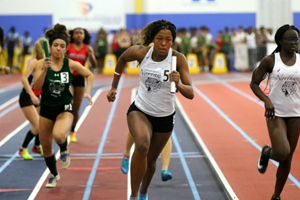 Blake High School broke its own meet record in the 4x200-meter relay, and Poolesville's Nandini Satsangi bounced back from a bad day at the Montgomery Invitational to win her first two county titles. 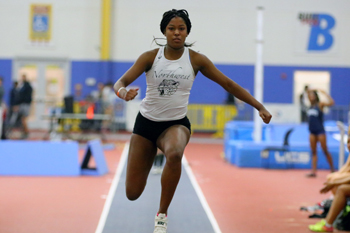 Northwest High School won its fourth consecutive girls indoor team title on Wednesday, and while there were many accolades to go around, the backbone through it all was senior Taylor Wright who accumulated 30 points individually with her sixth, seventh, and eighth career individual indoor county titles. In her career on the indoor oval, she won two high jump county titles, two triple jump county titles, and four consecutive county titles in the 55-meter dash. On winning four consecutive county titles in the 55-meter dash, Wright said, "I always recognize it's hard for people to do it continuously and it just happened for me. I think it's pretty crazy." She needed strength, both mental and physical, to make it through her four events including trials in the triple jump and 55-meter dash. While her 4x200-meter relay teammates warmed up towards the end of the meet, Wright recorded two fouls early in the triple jump competition and faced potential elimination without a mark. A previously sprained knee was not helping. "Earlier in the season," explained Wright, "I sprained my knee, so when I was jumping [today], it gave out on me a little bit. And I haven't practiced as much as I normally do because of my injury, so it was just a little off." She mustered a mark to get into the finals, and then after the 4x200 relay, she landed a mark of 37-09. It was the #7 best performance in meet history, but not exactly the best that the All-American is capable of. The high jump was similar with clearances at 5-04 and then 5-08 (#2 in meet history), but 5-10 was not meant to be. Said Wright, "I was tired but also my approach was off today. So coming up to the bar, I wasn't in rhythm basically. So when I was jumping, it just didn't happen for me." "Mentally, I've come a long way. I used to get in my head a lot. I think I've gotten better with that. Basically, I've gotten stronger." 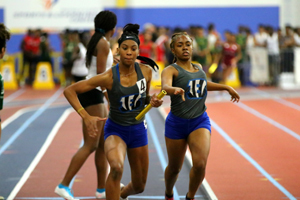 The Blake High School girls won the 4x200-meter relay for the third consecutive year, and for the second straight year, they broke the meet record. Last year, they lowered the record by almost a full second from 1:43.21 to 1:42.33 with a team from Northwest High School hot on their heels. This year, they dropped to 1:42.06 with no other team within three second. Three of the relay members were fresh for the 4x200-meter relay. The fourth relay member, Cyan Peoples, placed fifth in the 55-meter dash. Coach Brandon Tynes said that he wanted to get Peoples the work in the 55-meter dash, but other than that, he wanted to check on the progress of the relay before bigger meets to come. Said Tynes, "We didn't do too many open events because we're getting ready for the Virginia Showcase this weekend...It was kind of to see where we were just to get prepared for the weekend. Our next meet after the Showcase is at the Armory. We haven't had an opportunity to run a lot of relays this season so we just wanted to kind of see where they were." Tynes credited Noelani Phillips for leading off with a strong leg and putting the team where it needed to be. Cyan Peoples, Geligne Franklin, and Serena Harrison were never threatened during their record-breaking run. Later in the meet, Blake won the 4x400-meter relay for the third consecutive year. Blake's winning time of 4:02.02 ranks #3 in meet history. Blake now holds four of the top five spots in meet history in the girls 4x400-meter relay (2014, 2017, 2018, 2019). Poolesville's Nandini Satsangi is a three-time state champion and has won more than a half dozen regional titles on the track, but she had never won a county title until Wednesday. "I mean...feels pretty good," said Satsangi after she won her second county title of the day. 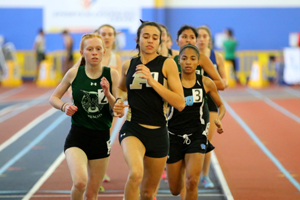 With a performance of 5:12.32 in the 1600 (#12 in meet history) and 11:17.26 in the 3200 (#7 in meet history), she became the first female county champion from Poolesville High School in both indoor events. She had to overcome a low point in her season when she dropped out of both the 1600 and 3200 at the Montgomery Invitational four days earlier. Prior to that, she was having a great season with PR's of 5:09.50 and 11:05.01, but she said that her epilepsy medication can alter her motivation and mindset. Instead of decreasing her workload, Satsangi and her coach decided to add the 4x800 relay to her workload at the county championship before the 1600-3200 double. She put together the fastest opening leg in the 4x8 field, turned around quickly to hold off a fresh Breanna McDonald by two seconds in the 1600, and won the 3200 by 30 seconds. "Today, I felt great today...able to make a good comeback," she added. Paint Branch's Kaya Rae Dunbar won the 55-meter hurdles by over a half second with the #2 fastest performance in meet history (8.18). Paint Branch's Janise Bestman won the shot put by over two feet with a mark of 37-02.00, the #8 performance in meet history. 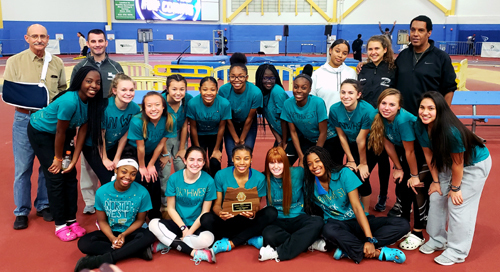 The Walter Johnson girls won the 4x800-meter relay for the fourth time in the last five years and eighth time in meet history. Whitman High School brought home the individual 800-meter title for the 8th time in meet history thanks to Breanna McDonald's efforts. 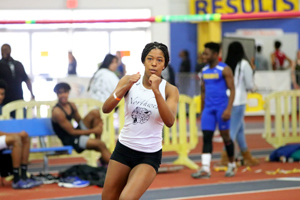 The underdog achievement superlative goes to Richard Montgomery's Caia Gelli who is running indoor track for the first time and dropped to 41.31 to win the 300-meter dash county title. The most improved superlative goes to Clarksburg's Brooke Shields who improved to 16-02 in the long jump in the first meet of the year and improved to 17-02 to win the long jump county title. 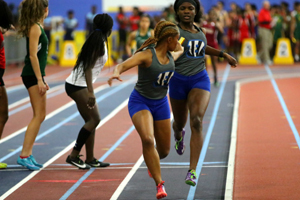 The grueling effort superlative goes to Gaithersburg's Michelle Kamara who finished 3rd in the 300m, 1st in the 500m, and 3rd in the 800m. No girl has ever won the 300m, 500m, and 800m at the indoor county championship meet, but that was probably the most valiant attempt.